3 balls Sensations Angel Hair #650 "TAN"
1 ball Sensations Angel hair #4323 "WHITE"
1 ball Lion Brand's Tweed Stripes #204 "MIXED"
You'll crochet the full length of the scarf first before crocheting the hood. The sizes below are for 5'7ish female adult (Kristin). You may adjust as necessary. Read the pattern first to get a feel for the flow, then you can gauge and change stitch amounts depending on how big/small you want it before starting. Secondly, there are a couple of directions that say to use the whole ball of yarn. Because I was making this pattern up while crocheting, I didn't exactly count some of the rounds where I used the entire ball of yarn. It is noted, and as you follow the pattern, you'll understand what I'm talking about. 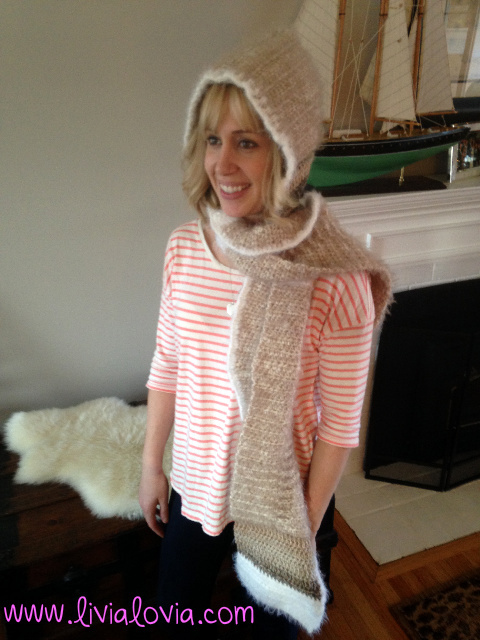 FIRST: Fold your completed scarf in half, find the center stitch, and place center marker (CM). Now, count 21 stitches on each side of the marker and place side markers. SECOND: Rnd1) Join MIXED yarn to first side marker, Ch2, HDC to other side marker (43). Remove both side markers and move CM up to new center stitch. Rnd2) Ch2, turn, HDC in each stitch to one stitch before CM, 2HDC in next stitch, HDC in CM, 2HDC in next stitch, HDC across. 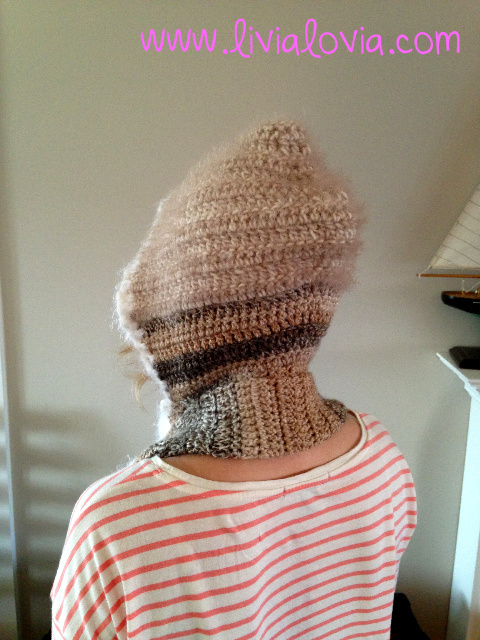 LAST: SL ST or whip stitch across top hood seam to close. FIRST: Join WHITE to Rnd9. Join on the front side (side where the hood opens). SC up to where the hood begins. SECOND: When you reach where the hood starts, ch2, DC in next st, ch2, skip one stich, DC in next st; continue the pattern until you cover the entire trim of the hood and you reach the other side of the scarf. 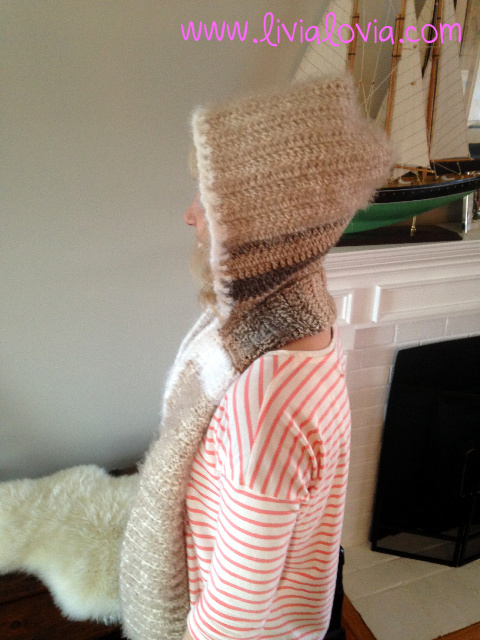 THIRD: When you finish trimming the hood, SC down the other side of the scarf and stop on Rnd139. *This design has been copyrighted. Please make and sell as you wish, but do not plagiarize, copy, or infringe upon my pattern -- it took a lot of effort, and I'd appreciate a shout-out or link!